Since the beginning of farming, growers have understood the profit ability of a crop is directly related to the equlity of the soils in which they are grown. Soils with low carbon content do not have the profitability or yields of the soils with higher carbon content. Gradual degradation of soil due to excessive use of chemicals fertilizers, continuous croping and harsh agriculture practice have reduced organic carbon, humus, water holding capacity, microbial population and adversely effected soil texture. The nutrient and micro nutrient dis-balance effected output. This couple with soil borne pathogens adversely effected the soil. Relying solely on different type of compost like city waste, animal waste, press mud etc for nutrient has some inherent disadvantage in terms of yield, availability and efficiency. The handling cost of such fertilizer calculated in terms of cost per nutrient is very high. Enriching different type of compost fortification input LIKE SANJIVNI , is the solution. It not only adds nutrient value but also help in digestion of compost,increasing efficiency and help repairing worn out soil repair. Enriched compost ensure better realization, Quality of output and long term soil enrichment. Sanjivni is certified for NPOP standard. The biotic compontent in sanjivni include LACTOBACILLUS CASEI, RHODOPSEUDOMONS PALUSTRIES, YEAST, GRAM POSITIVE ACTINOMYCETES: FILAMANTUS FUNGI PALUSTRI and MYCORRHIZA. All the above bacteria are packed with there food for higher shelf life and multiplication. 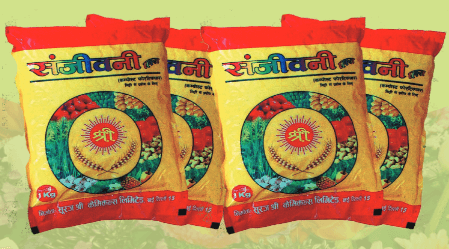 Sanjivni, it has organic N(2-3) P(4-6) K(4-7) and micro nutrients like Ca, Mg, S and Fe, mixed width active ingredients to dissolve and ensure easy and continuous availability of the nutrients to plant. Mixing sanjivni width compost like compost, cattle waste, press mud etc. For fortification. Best results from sanjivni can be achieved by mixing. Sanjivni with any type of compost in the ratio of 1:20 or 1:10 ina covered area and covering the mix with plastic for 24 to 48 hours. The mix get warms , this process kills pathogens in the compost and microbes grow throughtout the compost widely and fortify compost. Direct application on soil as source of NPK, micro nutrients and digestion crop waste. Packing Available: 4 kg., 20kg., 40 kg. It gradually reduces the dose of chemical fertilizer starting 10-15% in the first year. After few years the requirement of inorganic become very nominal. It control soil borne pathogens and convert organic waste into manure. It also improves the physical, chemical and biological status of the soil and increasing water holding capacity of soil and improves the soil texture. It improve the CN ratio. Reduces the quantity of compost requried per acre. Mycorhiza and humus in it, improves the soil and the productivity.Available beneficiary microbial colonies mixed with compost multiplies and destroy pathogen, digest the organic matter, ensuring nutrient in natural way. It consist bio organic NPK in the slow release form which boost the plant in the initial stage simultaneously the microbes start working.it also helps in decomposition of farm waste and undigested fiels waste, making optimal utilization resources available with the farmers.